"Little Red Book" redirects here. For other uses, see Little Red Book (disambiguation). Quotations from Chairman Mao Tse-tung (simplified Chinese: 毛主席语录; traditional Chinese: 毛主席語錄; pinyin: Máo Zhǔxí Yǔlù) is a book of statements from speeches and writings by Mao Zedong (formerly romanized as Mao Tse-tung), the former Chairman of the Communist Party of China, published from 1964 to about 1976 and widely distributed during the Cultural Revolution. The most popular versions were printed in small sizes that could be easily carried and were bound in bright red covers, becoming commonly known in the West as the Little Red Book. 6 Images from "The Little Red Book"
Quotations from Chairman Mao Tse-tung was originally compiled by an office of the PLA Daily (People's Liberation Army Daily) as an inspirational political and military document. The initial publication covered 23 topics with 200 selected quotations by the Chairman of the Chinese Communist Party, and was entitled 200 Quotations from Chairman Mao. It was first given to delegates of a conference on 5 January 1964 who were asked to comment on it. In response to the views of the deputies and compilers of the book, the work was expanded to address 25 topics with 267 quotations, and the title was changed simply to Quotations from Chairman Mao Tse-Tung. On 10 January, the work was re-issued to the delegates and sent to select units of the People's Liberation Army who received their advance copies for educating troops as well as for their comments. In May 1964, the PLA General Political Department, the chief political organ under Central Military Commission, revised Quotations, adding a half title page with the slogan "Workers of the world, unite!" (全世界的无产阶级，联合起来！) in bold red letters, and endorsement leaves written by Lin Biao, Mao's chosen successor, that included three lines from the diary of revolutionary soldier Lei Feng who is considered a hero in China. This version was issued "for internal use" to the military leaders. Following discussions that expanded the book twice more—finally closing on 33 topics and 427 quotations by Mao—the commission began publishing the definitive version in May 1965. At the end of 1965, the Central Committee of the Communist Party of China officially approved the book for publication by the People's Publishing House and for distribution within China by the Xinhua Bookstore. The Ministry of Culture held special study meetings to develop a production and distribution plan. It sought assurances that the book would receive publishing priority and that there would be sufficient paper, ink, and printing presses available. The goal was for "ninety-nine percent (of the population of China to) read Chairman Mao's book", according to a catalogue of publication records of the People's Publishing House. Provinces, municipalities, and autonomous regions across China were ordered to build hundreds of new printing houses to publish the Quotations during the second half of 1966 which pushed the limits of the Chinese printing industry. This disrupted plans for publishing any new volumes of The Complete Works of Marx and Engels that was already in progress. It also halted distribution of other ideological works. 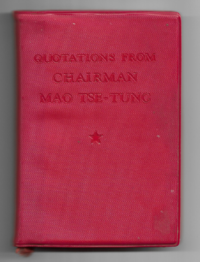 As late as 1970, more than 8 million copies of the 4-volume set of Selected Works of Marx and Engels that had already been printed (both in cloth hardcover and paperback) remained undistributed in storage warehouses on the grounds that other works "should not interfere with learning Quotations from Chairman Mao Tse-Tung". On the other hand, several other works by Mao had very large printings during the same period, even though these editions were not produced in the huge numbers of Quotations from Chairman Mao. These include Selected Works of Mao Zedong (in four volumes, 2.875 million copies in 14 languages), Selected Articles of Mao Zedong (various editions totalling 252 million copies), single article books, and works of poetry. Cover of the first edition English version of the Little Red Book circa 1966. Chairman Mao from 1966 French edition, Beijing. In 1966, the Publicity Department of the Communist Party of China approved Quotations from Chairman Mao for export. To meet overseas requirements, the editors of the Chinese Foreign Languages Press made revisions necessitated by the situation. They added a "second edition preface" endorsement by Lin Biao, dated 16 December 1966 (which was torn out following Lin Biao's death and public disgrace in September 1971). On the last page, they listed the names of the publisher (PLA General Political Department) without an ISBN, the printer and distributor (both Xinhua Bookstore), and the publication year. By May 1967, bookstores in 117 countries and territories around the world – including Great Britain, France, Spain, Japan, the Soviet Union, Germany, Italy, Nepal, Indonesia, Burma, Iran, Arab and African nations and others – were distributing Mao's Quotations. Foreign presses operating in 20 countries contributed to the publication of 20 translations in 35 versions. The Little Red Book has produced a wide array of sales and distribution figures. Some sources claim that over 6.5 billion printed volumes have been distributed in total, others contend that the distribution ran into the "billions," and others cite "over a billion" official volumes between 1966 and 1969 alone as well as "untold numbers of unofficial local reprints and unofficial translations." The book's popularity may be because it was essentially an unofficial requirement for every Chinese citizen to own, to read, and to carry it at all times during the latter half of Mao's rule, especially during the Cultural Revolution. The most widely produced editions of the Quotations of Chairman Mao were published with a printed red vinyl cover wrapper over cardboard with pages bound in 64 folios that included colour photos of Mao. Other editions of the book were covered in cloth, silk, leather, paper, and other materials. Most editions were produced in a functional, compact size that fitted into a pocket, were easy to carry, and could be taken out at any time "for practice, learning, application." It was published in 32 other common sizes, allegedly the largest format printed on only 4 pages as large as the newspaper Reference News, and the smallest format the size of a matchbox. Study Chairman Mao's writings, follow his teachings, and act according to his instructions.-Lin Biao (with his name scratched out) on the Huayang Palace in Jinan, photo 2007. Today in China, the book is a symbol of Mao Zedong Thought. The tradition of the ritual chanting of slogans originated with Lin Biao, whom Mao Zedong met in the Red Guard. Among the best known is: "Saying Wansui (literally: 10,000 years old) in their mouths, holding the Quotations (from Chairman Mao) in their hands!" (Chinese: 万岁不离口，语录不离手！) which became a cliché of dogmatism or formalist irony. Faint words from Chairman Mao's Little Red Book, painted during the Cultural Revolution, still appear on walls in some Chinese villages, photo 2005. In certain situations, the Quotations is given as a gift, for example, when public funds are involved, or when personal events arise, such as congratulating newlyweds, and so on. Foreign press report called the work "The Little Red Book", reflecting its common small size and bright cover. After the Cultural Revolution ended, some Chinese people also adopted the nickname (back-translated into Chinese as "The Treasured Red Book") simplified Chinese: 红宝书; traditional Chinese: 紅寶書; pinyin: hóng bǎoshū. During the 1960s, the book was the single most visible icon in mainland China, even more visible than the image of the Chairman himself. In posters and pictures created by CPC's propaganda artists, nearly every painted character, whether smiling or looking determined, was seen with a copy of the book in his or her hand. After the end of the Cultural Revolution in 1976 and the rise of Deng Xiaoping in 1978, the importance of the book waned considerably, and the glorification of Mao's quotations was considered to be left deviationism and a cult of personality. Today in China, the book Quotations from Chairman Mao Tse-Tung is mostly a piece of nostalgia. Various editions are popular with some collectors, and rare and unusual printings command extremely high prices. It may be purchased at shops in Beijing, Shanghai, other major cities in China, as well as at some tourist attractions. Images from "The Little Red Book"
Quotations from Chairman Mao Tse-Tung consists of 427 quotations, organized thematically into 33 chapters. It is also called "Thoughts of Chairman Mao" by many Chinese people. The quotations range in length from a sentence to a few short paragraphs, and borrow heavily from a group of about two dozen documents in the four volumes of Mao's Selected Works. In the book's latter half, a strong empiricist tendency evidences itself in Mao's thought. Usually the quotations are arranged logically, to deal with one to three themes in the development of a chapter. The table below summarizes the book. 1 13 The Communist Party The Chinese Communist Party is the core of the Chinese revolution, and its principles are based on Marxism–Leninism. Party criticism should be carried out within the Party. 4 16 The Correct Handling of Contradictions Among the People There are at least two basic kinds of contradiction: the antagonistic contradictions which exist between communist countries and their capitalist neighbors and between the people and the enemies of the people, and the contradictions among the people themselves, people unconvinced of China's new path, which should be dealt with in a democratic and non-antagonistic fashion. 8 10 People's War China's masses are the greatest conceivable weapon for fighting against Japanese imperialism and domestic reactionaries. Basic strategic points for war against the Kuomintang are also enumerated. 11 22 The Mass Line The mass line represents the creative and productive energies of the masses of the Chinese population, which are potentially inexhaustible. Party members should take their cue from the masses, and reinterpret policy with respect to the benefit of the masses. 14 6 Relations Between the Army and the People An army that is cherished and respected by the people, and vice versa, is a nearly invincible force. The army and the people must unite on the grounds of basic respect. 18 7 Patriotism and Internationalism The patriotism of a communist nation and an internationalist sympathy for just struggles in other countries are in no way exclusive; on the contrary, they are linked deeply, as communism spreads throughout the world. At the same time, it is important for a country to retain modesty, and shun arrogance. 29 11 Cadres Cadres, the instrument for uniting with and working for the people, must be leaders versed in Marxist–Leninism. They must have both guidance and the freedom to use their creative inititave in solving problems. Newer cadres and older cadres must work together with a comradely respect, learning from each other. 33 16 Study It is the responsibility of all to cultivate themselves, and study Marxism–Leninism deeply. It is also necessary for people to turn their attention to contemporary problems, along empirical lines. ^ "How Much Did Mao Zedong, Deng Xiaoping, and Jiang Zemin Get Paid for Their Publications?". ChinaScope Magazine, September 2005 (Updated 8 February 2008), article by Jiao Guobiao. Retrieved 10 March 2010. ^ Shaw, Karl (2005) . Power Mad! [Šílenství mocných] (in Czech). Praha: Metafora. p. 92. ISBN 978-80-7359-002-4. Bristow, Michael (2007). "Who Owns Mao's Millions?" BBC News. Cook, Alexander C., ed. (2014). Mao's Little Red Book: A Global History. Cambridge University Press. DeFrancis, John (1975). Annotated Quotations from Chairman Mao. Yale University Press,. ISBN 0-300-01870-3. Han, Oliver Lei. Sources and Early Printing History of Chairman Mao's "Quotations". Wikimedia Commons has media related to Quotations from Chairman Mao.